With the latest news that low-spend advertisers will now get broad volume ranges rather than traditional keyword volume in Google Keyword Planner, I couldn’t help but laugh. I won’t pretend that I have always given Google the benefit of the doubt, I’ve certainly criticized the company many times, sometimes for good reasons, sometimes not. But this is so hysterically bad that I just had to step back and point out how ridiculous it has become. There are basically 4 different sources of keyword search volume data that you can get from Google. Because we will be looking at Google Search Console data, I chose to hide the exact keyword I chose for this analysis. 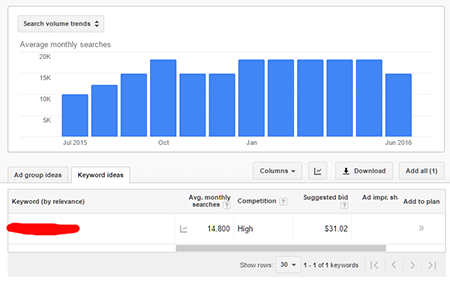 Below is a standard output you might expect to see from Google Keyword Planner. So if you are just starting out a new Adwords campaign, you will have to play a little guesswork given that all you know is the real traffic number is somewhere between 10,000 and 100,000. I wonder how this Keyword Planner data compares to Google Search Console data. I happen to have a former client who ranks right in the middle of the top 10 for this generic, national term, so we can compare their data from the last 28 days with that recorded by Google Keyword Planner. Hmm, the last 28 days have actually delivered over 22,000 impressions for this term. The number is nearly 50% greater than recorded by Google Adwords Keyword Planner (original version), but hey, at least it still falls within the 10,000 to 100,000 range in the new version! Well, maybe we have another choice. Let’s take a look at Google Keyword Forecaster. Traffic Forecaster allows you to set bids and get an estimate of how much traffic you would get. Setting the value sufficiently high should get us a number of impressions. This number is pretty good. It is still 50% greater than the original Keyword Planner number, but it is pretty close to the number from Google Search Console. This appears to be our best refuge at the moment. But let’s check one last source – Google Trends. Maybe there is hope there. While we don’t get actual data from Google Trends, we do get a monthly comparison. We should expect that the ups and downs of traffic in Google Trends would reflect the ups and downs in real search volume, which means if we have real search volume from 1 month, we can multiply it against this month’s proportions and get a good number. So, how do things look? Well, I’ve got some bad news. 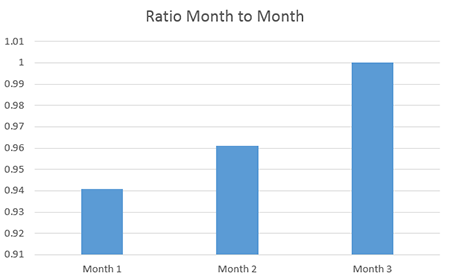 While Keyword Planner shows that last month was lower than the 2 previous months, Google Trends shows that the ratio is higher this month compared to the previous 3. The trend is exactly opposite of what we would expect! Volume data from Google is becoming wholly untrustworthy. 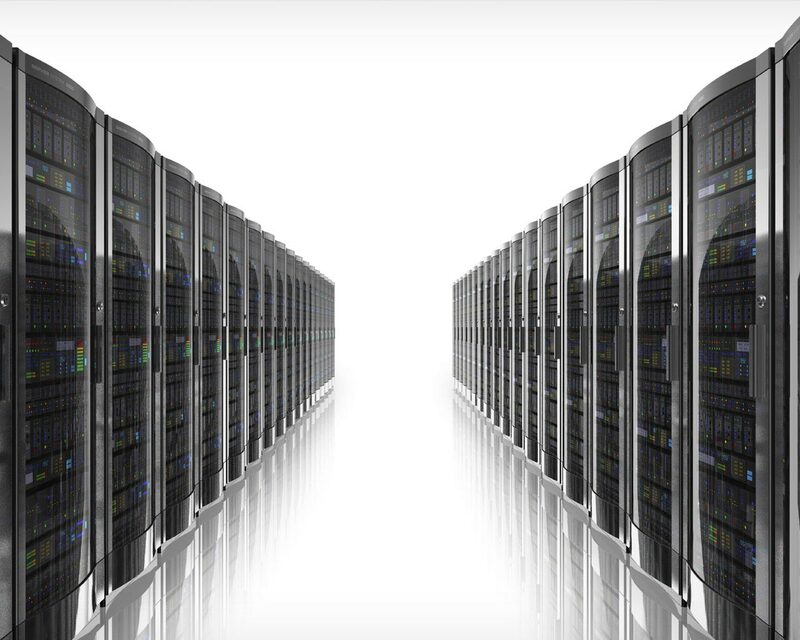 The closest two data points are that of Google Search Console and Traffic Forecaster with an exceptionally high bid. So, right now, my guess would be to rely on Traffic Forecaster while you can. But the second Google puts the throttle on that, it might as well be lights out. We all know that keyword research is an essential activity at various stages of an SEO campaign but boy has Google made a mess out of it.